I let Jessi flip through the book and pick a project that appealed to her. She picked 8 projects but eventually I got her to narrow it down to an adorable fabric basket. And she whipped up this basket in less than an hour with very little help from her mom. So exciting for me!!! I made Jessi read through the instructions and I was impressed that between the clear instructions and wonderful pictures, she really was able to figure out what she was doing on her own. She only needed help with a few terms like "face up" and "face down", and those were great teaching moments. And before you knew it, (seriously less than an hour) my little 8 year old had made this adorable fabric basket, following the instructions all on her own. I really loved that each of the projects in this book are simple enough to not frustrate a beginner or younger sewer but big enough to really make my daughter feel like she is sewing! And now her fabric basket accomplishment is being used as a jewelry box and she proudly shows it off to all of her friends that come over. I can't tell you how it makes me smile when she explains how she did it all on her own. Good Luck and Have a Happy Quilting Day!!!! Your daughter did a fantastic job! And only 8 years old! 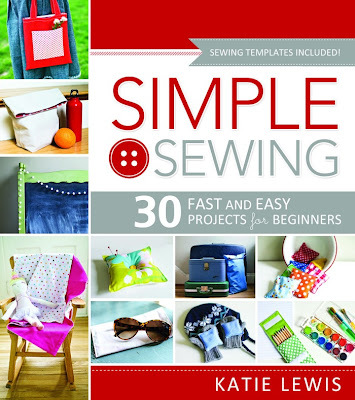 the book looks like it has a lot of fun and quick projects too! It looks great! My kids have been having fun choosing projects from the book too! I can highly recommend it. It looks like a wonderful book and would love to win! Thanks for a chance to win! Looks like your daughter is going to fill your shoes someday. That must make you feel good. Love that little basket! It would make a great gift for the holidays with some cookies or candies in it! Looks like a great book. I'm always looking for new titles. Thanks. Jessi did such a great job. Congratulations to Jessi! I've always love the little fabric baskets and been intimidated by them. Maybe if an 8 year old can do it, a 61 year old can do it. Jessi did a wonderful job. I bet you are just beaming with pride as is she. She did an amazing job. Now I want to do that. My best(est) quilting friend has two granddaughters. One is learning to sew a little. If I'm not lucky enough to win, I'm thinking of buying this book for her as a Christmas present. The second granddaughter will be learning very soon. I just found out that I have a 4 1/2 month old granddaughter, so she's just a little young to think about teaching her to sew. However, I have three grandsons, so I am thrilled to be looking for my box(es) of lace and finding my pink fabrics - some left from my daughter, too. My son is over the moon at the DNA results as am I. Congrats to Jessi and bless you for starting her on a life of crafting. My daughter crafts and does not sew.